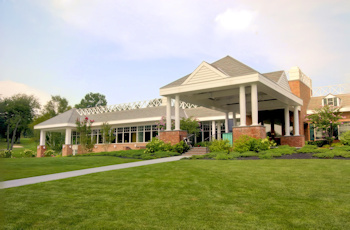 The location and accessibility of the new North Hills Golf Club are unsurpassed in the Metropolitan area. Natural flowing land has invited the creation of an exceptionally beautiful	golf course with sweeping fairways, gently contoured greens and sparkling ponds. The 6730 yard, par 72 golf course has been carved out of the rolling forest of the	Allen-Boggs-Levitt Estates in the Village of North Hills. This virgin timber was cleared with	great care to save the best of the stately tulip trees, oaks, sweet gums and birch for a	beautiful arboreal setting. A screen of trees has been preserved along the borders of the	property and will be augmented where necessary to insure privacy for the members. The holes flow with the contour of the land and have been graded for easy walking. The contouring provided good target areas, natural green sites and large tees. The sequence of the holes is such that no two succeeding holes are alike either in length or shot values, and each hole presents a fair challenge to both the low and high handicap golfers. The long tees and the generously proportioned undulating greens with their varied pin positions offer endless combinations of dynamic playing conditions to enjoyed by all the pros, the duffers, the women, the young and the old.